This is a highly recommended H2H style basic top tee, comfortable, soft skin friendly, and relaxed silhouette. Good of brand H2H process high quality fabric and fine workmanship. And we have rich offer. 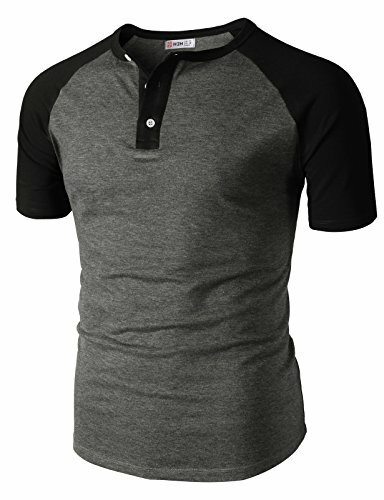 * Mens Basic Slim Fit Raglan Baseball Three-Quarter Sleeve T-Shirts that is very compact and casual everyday piece of statement. * It is good a great gift for your best friend, significant other, or anyone who enjoys expensive looked t-shirts. * Expedited Post Service: In the case of fulfilled by H2H, It takes only 5 to 10 days for delivering after shipping from Korea. (Except P.O. Box). 1. The actual color may be slightly different from the image caused by different brightness of various monitors and brightness. Please kindly understand about it and we cannot guarantee about the problems with color difference. 2. Please refer to the size chart listed below or let us know your weight and height in stones or lbs. and inches. This T-shirt is a fashion basic thanks to the contrast colored raglan short sleeves. The Henley style round neckline includes a three-button placket. Great for Daily and Casual Wear, High Softness & Wearability. If you have any questions about this product by H2H, contact us by completing and submitting the form below. If you are looking for a specif part number, please include it with your message.